I write copy for promotional films and enjoy creative writing; I'm currently working on a trilogy of books called The Stone-Tape Chronicles. A washing line cleat. (I know what you're thinking. Wow! But read on..) The left half of the image was taken in 1979, the right half in 2017. 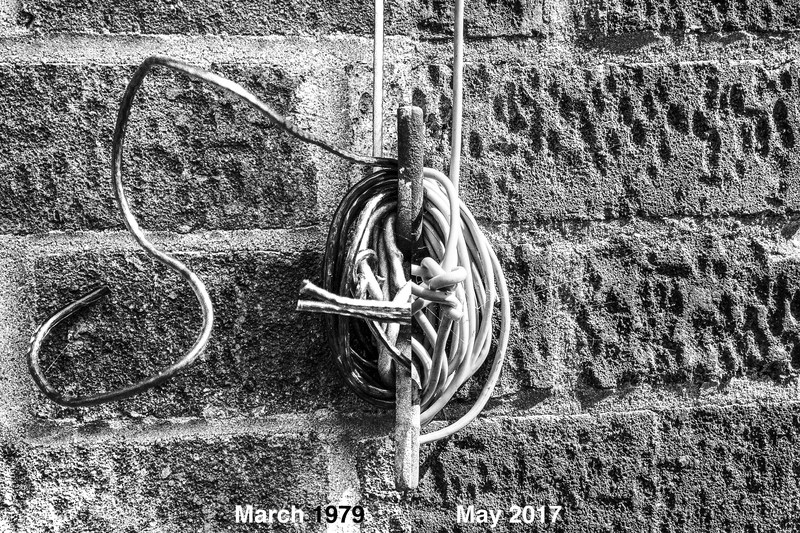 Same cleat, same wall, different nylon line; 38 years separate the two halves of the image. However, if the joining line down the centre was never seen and the dates never included, how many would noticed the two identical, yet separate images? I press the camera's shutter release because what I'm looking at is something I want to keep, as if asking a question. A photograph seems rarely to offer an answer, so I keep taking more photographs. All human experience is captured in countless images and the photograph, although it can never reveal the process of time, can reveal the many occasions it begins and ends; on average in about 125th of a second. A moment so fleeting yet so infinite, this may seem trivial, irrelevant even meaningless; but to me it's important: Why? ... I like taking photographs at the seaside as well! Me, a camera and any seaside town, especially in winter.